There are many types of heart conditions, and your doctor may recommend certain tests or procedures to diagnose your condition appropriately. Some of these tests are performed at CVA’s Main Campus by Brookwood Baptist Medical Center Diagnostic Services, others are performed at the Brookwood Baptist Medical Center, Citizen’s Baptist Medical Center, Grandview Medical Center, or Coosa Valley Medical Center. Your cardiologist will provide you with details related to your condition and any specific diagnostic tests that are recommended for your care. Click the title to view the details of the various tests listed below. A safe, painless non-invasive procedure that uses ultra-high-frequency sound waves to look at the abdominal aorta, the large artery that carries blood from the heart to lower half of the body. The test is usually ordered to look for both blockages and enlargement (aneurysm) of the abdominal aorta. A non-invasive procedure that uses ultra-high-frequency sound waves to look at the arteries of the upper or lower extremities. The test is usually ordered to look for blockages of the arteries in the arms or legs that can cause decreased blood flow leading to pain and infections that do not heal. Also called angiogram and angiography; an arteriogram is an invasive x-ray imaging test that is used to visualize arteries. Contrast dye is injected through a catheter into an artery or vein, and x-rays are taken of the dye as it passes through. This test may be ordered to check for blockages or damage affecting blood flow. Also called a cardiac cath, heart catheterization, and coronary angiogram; cardiac catheterization is an invasive test that directly visualizes the blood flow in the heart. Contrast dye is injected through a long narrow tube that is inserted through the leg or wrist artery and into the blood vessels of the heart. X-ray pictures are taken of the dye as it passes through the arteries. A diagnostic imaging test that indirectly evaluates the heart’s blood supply. Similar to the Nuclear Stress Test (SPECT), a cardiac PET stress test uses a different radioactive tracer and a highly efficient scanner. The test measures areas of heart muscle that do not have a good blood supply, which is usually due to blocked arteries in the heart. Also called carotid doppler or carotid duplex; carotid ultrasound is a safe, painless procedure that uses ultra-high-frequency sound waves to look at the arteries of the neck that supply blood flow to the brain. The test is usually ordered to look for blocked carotid arteries that increase the risk of stroke or TIA. Also called CT angiography or CTA; computed tomography angiography is a diagnostic imaging test that visualizes the veins or arteries. Contrast dye is injected through an IV, and CT scans are taken as the dye passes through the circulatory system, producing three-dimensional images of the blood vessels. This test may be ordered to diagnose an obstruction, narrowing of the arteries, or other vascular condition. Also called an echo, echocardiogram is a type of ultrasound test that is safe and painless and allows your physician to look at the structures of the heart. It uses ultra-high-frequency sound waves that are produced by a transducer held outside the chest wall. The ultrasound signal results are displayed on a monitor as a moving picture of the heart. The results allow for visualization of the heart size and function, as well as heart valves. A 3D image that can be manipulated by the physician to look at the structures of the heart from different views may also be ordered. Also called an ECG or electrocardiogram, EKG is a safe, non-invasive test that measures the electrical signal that is produced during each heartbeat. The test is commonly ordered to detect abnormalities in the heart rhythm or changes that can suggest heart attack. A portable recording device used for continuously monitoring the electrical activity of the heart for 30 days. It is used to detect cardiac arrhythmias (abnormal heartbeats). Although the device is constantly recording your heart rhythm, it requires the user to press a button when they feel symptoms so that the current heart rhythm can be tracked. The recording device can be worn under clothing. You should not limit normal daily activities, since the purpose is to record the heart rhythm during normal activity. Since it is an electrical device, it should be kept dry, and the device must be temporarily removed for showering or swimming. Used to gather information about how well your heart works during physical activity, the exercise stress test usually involves walking on a treadmill while your heart rhythm, blood pressure and breathing are monitored. This test is commonly ordered to determine the presence of coronary artery disease or an irregular heart rhythm (arrhythmia). A portable recording device used for continuously monitoring the electrical activity of the heart for 24 hours. It is used to detect cardiac arrhythmias (abnormal heartbeats). The recording device can be worn under clothing. You should not limit normal daily activities, since the purpose is to record the heart rhythm during normal activity. Since it is an electrical device, it should be kept dry, and the device must be temporarily removed for showering or swimming. Also called nuclear magnetic resonance or MRI, this non-invasive diagnostic imaging test combines the power of magnets and radio waves to produce a visualization of the heart. Unlike some other imaging methods, it does not use radiation and provides detailed images of the heart and blood vessels at a variety of angles. It may be ordered to give your doctor more information about a cardiac condition or to evaluate damage after a cardiac event. Also called an Equilibrium Radionuclide Angiogram or Blood Pool Scan; MUGA is a noninvasive diagnostic test used to evaluate the pumping function of the ventricles of the heart. During the test, a small amount of radioactive tracer is injected into a vein. 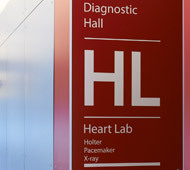 A special camera detects the radiation released by the tracer to produce computer-generated images of the beating heart. This test is used to measure the heart’s pumping function. A myocardial perfusion SPECT (Single Photon Emission Computed Tomography) stress test is used to indirectly evaluate the heart’s blood supply. A radioactive tracer is injected into a vein, which is absorbed into the heart muscle cells that have a blood supply. The test measures areas of heart muscle that do not have a good blood supply, which is usually due to blocked arteries in the heart. Also called a peripheral angiogram; peripheral catheterization is an invasive test that directly visualizes the blood flow in the blood vessels outside of the heart. Contrast dye is injected through a long narrow tube inserted in the leg or wrist artery. X-ray pictures are taken of the dye as it passes through the arteries that are being imaged. This test can be used to look at arteries in the arms, legs, abdominal cavity, kidneys, neck, and brain. Also called a pulmonary artery catheterization or Swan-Ganz catheterization; during this test a catheter is inserted into a large vein and carefully guided through the right side of the heart to the pulmonary artery. The procedure is used to determine the location of narrowing or blockages in blood vessels, measure pressure in different areas of the heart, or evaluate and monitor heart conditions. Also called a stress echo, a stress echocardiogram is an ultrasound test that looks at the heart function before and after stressing the heart. It uses the same ultra-high-frequency sound waves that are used in an echocardiogram. Pictures are obtained at baseline, and then repeated immediately after walking on a treadmill. If you cannot walk on the treadmill, the heart can be stressed by giving an injection of medication that speeds up the heart. Pictures are compared to identify weakening of the heart during stress, which usually implies the presence of a blockage. Also called upright tilt testing; a procedure that helps inform a physician about what cardiovascular conditions may be causing unexplained episodes of fainting (syncope). Also called a TEE, it uses the same ultra-high-frequency sound waves that are used for an echocardiogram. A transducer tube is passed into the stomach, which lies next to the heart. Since the transducer is placed in close proximity to the heart, the images are clearer with better detail. These high quality images are helpful in detecting blood clots, masses, and tumors that are located inside the heart. It can also better evaluate the severity of certain valve problems and help detect infection of heart valves, congenital heart diseases abnormalities, and dissection (tearing) of the aorta. Also called venous doppler or venous duplex, a venous ultrasound is a non-invasive procedure that uses ultra-high-frequency sound waves to look at the veins of the arm or leg that return blood flow to the heart. The test is usually ordered to look for blood clots in the arms or legs that can cause swelling and possibly break off and block the blood vessels in the lungs.